Let Art Freedom Ring was a project sponsored by the National Liberty Museum and the Philadelphia Arts in Education Partnership. I worked with teacher Sam Reed, art teacher Sonya Smith and about 30 students at Beeber School in Philadelphia. 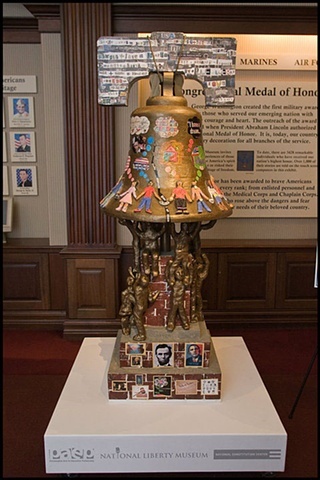 Our finished mixed media collaboration of the 6' Liberty Bell sculpture, along with those from 4 other schools was unveiled at The National Liberty Museum in June of 2010, then was moved to The National Constitution Center. We won recognition for "Best Concept", the concept being that it takes each other's support and cooperation to sustain liberty and to manifest our own personal dreams of freedom. The "brick" foundation of the piece has images that represent the foundations of our democracy, and the yoke of the bell references our freedom of speech. The students made the clay relief figures on the bell and the figures holding up the bell. Decoupaged images that the students drew or found in their research are throughout. Our bell will be one of two that will be part of the permanent collection at The National Liberty Museum.